“I see … potential in Stacey Abrams,” the voice said. 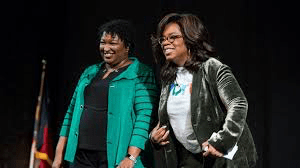 “Where others see a poor man’s Aunt Jemima, I see someone white women can be tricked into voting for, especially the fat ones.”…. Both Stacey Abrams and Brian Kemp are speaking out against “vile” robocalls from an Idaho white nationalist targeting the Democratic nominee for Georgia governor.